I think it’s safe to say that the workshops went down a storm, and I’m delighted to announce that using the invaluable feedback I received, Southend’s Therapy Life Centre and I will be running a series of monthly Happiness workshops – starting in January 2013 – to coincide with the re-launch of the paperback. If you’re a big-reader of self-help then you’ll probably be familiar with workshops, seminars, and the like. Large halls packed with badge wearing delegates, all facing the stage and podium in readiness for a motivational speaker who will cause you to question everything you believe, shake the foundations of all you hold dear, and force you to reconsider every assumption you’ve ever made. This isn’t one of those workshops. 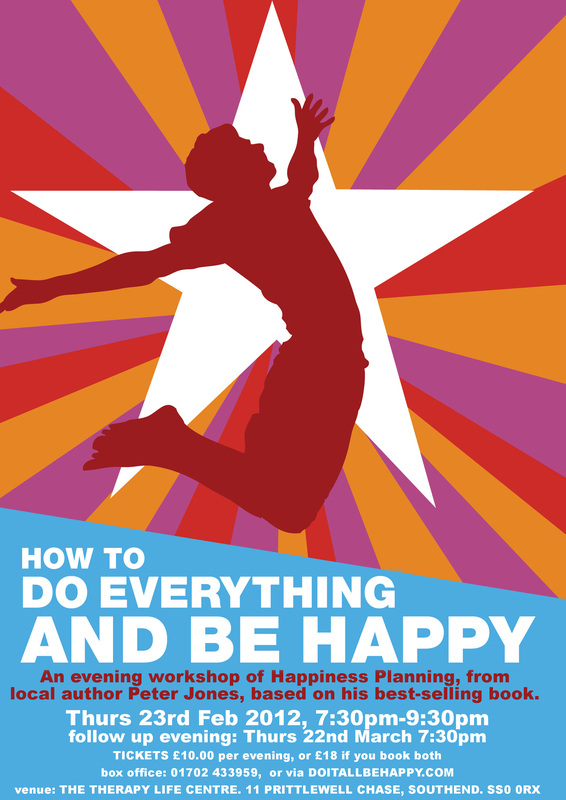 ‘How to Do Everything and Be Happy’ is a workshop for ordinary people, with ordinary lives. It’s for anyone who may have been ambling through life and wondering why they’re not – well – just that little bit happier. It’s a workshop for most people. It’s a workshop for you! If you’ve got a brain in your head, if you can pick up a pen, if you’ve got half an inkling about what makes you smile, this series of workshops will show you how to fit those things into your life and, as a consequence, feel much, much happier. This is a brand new format based on feedback from previous workshops. Workshops are on the last Thursday of each month and last two hours (including a ten minute break around half time).